Check out all the photos from the Grand Prix of Houston doubleheader with driver Oriol Servia and the National Guard Panther team. Check out all the IMS Photo images from the historic road course test at the Indianapolis Motor Speedway. Check out all the images from the Baltimore Grand Prix, including Oriol Servia's visit to Fort Meade, Walter Reed Hospital and all the on-track action from the weekend. Check out all the photos of Ryan Briscoe and the National Guard Panther Racing team from the GoPro Indy Grand Prix of Sonoma. 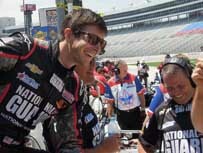 Check out all the photos of Panther Racing, Oriol Servia and the team's National Guard employment program.